The Underwater Communication & Navigation Laboratory, a resident startup of the Skolkovo Foundation’s advanced manufacturing, nuclear and space technologies cluster, has created a unique underwater navigation system known as RedWAVE. In this column written for Sk.ru, Alexander Dikarev, head of the company’s research and development department, outlines how the product was developed and the possibilities the technology offers. 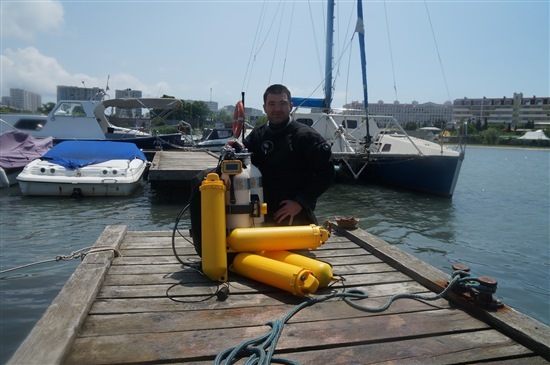 Andrei Kulagin, a diver from the Underwater Cultural Heritage NGO, with the RedWAVE navigation system. Photo: UC&NL. Modern life is hard to imagine without the GPS and GLONASS satellite navigation systems. However, radio waves do not penetrate water, and until recently, underwater navigation was available only to the military or in the form of fabulously expensive industrial solutions. Underwater, inertial navigation is possible based on the calculation of an object’s movement from a known point on the surface, but even the most expensive systems give an error accumulation of hundreds of meters in half an hour. To understand all the difficulties in creating a good inertial system, imagine that you are blindfolded and driven around the city by car. Memorizing all the turns, acceleration and deceleration, you try to figure out where you are. But over time, you will not only cease to understand the movement of the car, but also the speed at which it is moving. There are also acoustic signals in water. Our cohabitors on the planet who live in the oceans long ago learned to use sound for underwater navigation instead of sight. In the last five to seven years, a lot of information has appeared online promising consumers various extents of "real underwater GPS,” but officially no one has yet announced the start of sales. No one, that is, except us. The Underwater Communication & Navigation Laboratory (UC&NL) team set itself the goal of making a reliable system that offers similar functionality to that of regular GPS and GLONASS, is easy to use and works underwater. We took the functioning of satellite navigation systems as a basic principle, but instead of satellites, four small RedBASE buoys on the surface of the water retransmit the satellite signal underwater in the form of acoustic waves. This type of navigation system is called a long base-line, or LBL. 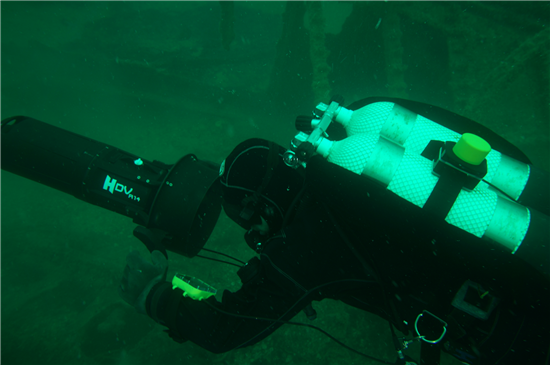 The RedNAV diver navigational receiver in action. Photo: UC&NL. It takes only 10-15 minutes to position the buoys on the surface of the water before diving. After that an unlimited number of divers wearing the RedNAV navigation device or underwater robots fitted with RedNODE navigation receivers can simultaneously determine their exact geographical position underwater. 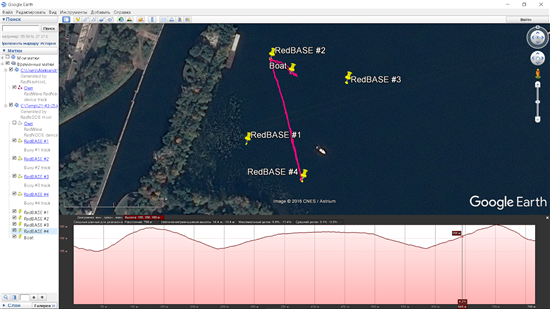 Like GPS navigators, the RedNAV navigation device saves the full route of the diver's movements. Divers can also upload up to 20 points along the route in advance via Bluetooth. Once underwater, divers can mark their location with a single click of a button. It can then be unloaded from the device together with the route, saved or uploaded to Google Earth. Never before has underwater navigation been so close in terms of simplicity and accuracy to regular overland navigation. The navigation receiver is available in two versions: for divers, with information output to an OLED display, and for underwater robots. A unified protocol with standard GPS/GLONASS navigators makes working with our device virtually no different from working with conventional GPS modules. The unique technology of digital broadband hydroacoustic noise-immune communication makes it possible to obtain position accuracy of about one meter, even in difficult conditions with strong signal reflections (this effect in acoustics is called multipath). 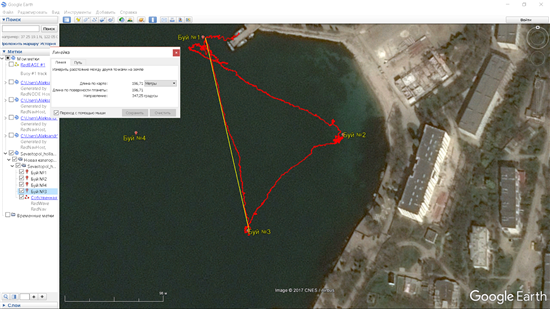 On this route, you can see how the diver passed near the buoys with ease and returned to the starting point. The RedWAVE system currently has no analogues either in Russia or abroad. Its price tag is far lower than the most basic and inexpensive imported industrial solutions, while it is incomparably advanced in terms of functionality and precision. We are proud that the entire design and production process of the RedWAVE system, from sketch to serial production, took place in our country. “The developers from the Underwater Communication & Navigation Laboratory have managed at an early stage to achieve a relatively high degree of accuracy in determining locations, which is already opening up many niches for the commercial application of this solution in industrial systems, such as the oil and gas industry.